Tired of kicking at the wall at night when going to kitchen, bathroom, bedroom, hallway or stairways? Realized that the room lights are too harsh for your families when sleeping? Looking for a smart, practical and energy-saving night light to help ease your kids' fear of darkness? DON'T WORRY! This Led lamp is designed to solve these problems. With dusk to dawn sensor, it turns on at dark area automatically to emits gentle light that is bright enough to see the path and turns off when the area is bright enough. So you don't need to turn on room lights when going to bathroom or other places at night. In addition, except for warm white, this night light can also be transferred from 8 other colors in order smoothly or you can just set it in your kids' favorite color to pacify your kids at night. When plugged into the offset outlet, this night light will have a color calibration among red, green, blue and warm white first before cycling from all 8 colors. 1. 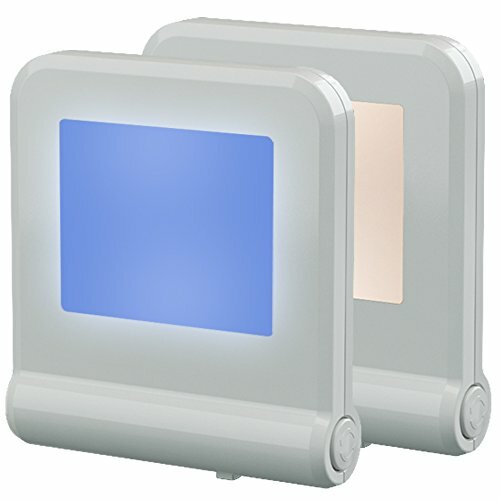 Plug the night light to socket and shift the bottom switch to left or right (left for warm white light, right for 8-color cycling mode), then this night light will be turn on in darkness. 2. When on color cycling mode, press the side button to set color and press again for color cycling. 3. Turn off automatically at dawn, or turn off manually by shifting the bottom switch to middle. ★MULTIPLE COLOR CHANGEABLE & SPECIFIC COLOR SETTABLE: This plug night light is multiple color changeable that it can change among more than 8 colors to create romantic atmosphere. Moreover, you can just press the round button on the right to set the light in your favorite color. ★AUTO ON/OFF & SMART DUSK TO DAWN SENSOR: This night light equips with a warm gentle glow and dusk to dawn sensor. Plugging it on the socket, then it will turn on automatically when other lights are off or at dusk and stay on continuously until lights are turned on or at dawn. In addition, equipped with 0.5W LED, it's as energy efficient as only $0.266 per month, which will save you much money when bringing you convenience and happiness. ★ULTRA-SLIM DESIGN & MEMORY FUNCTION: The plug-in, ultra-slim and cool-touch modern design night light is unique and space-saving that when being plugged in the wall socket, it will not cover up the second outlet and can fit flat against the wall instead of sticking out to affect your daily walking life. Besides, its memory function will remain the color you selected before to add convenience. ★VARIOUS APPLICATION OCCASIONS: This plug-in night light can be used in any indoor place with socket to light up your path or surrounding area to bring you brightness, convenience and security in darkness. It's available in anywhere like bedroom, bathroom, kitchen, corridor, hallway, stairway, basement, etc. It's also perfect for children's rooms to give your kids comfort with it's gentle colorful light, it can even be used to guide your lovely pets around the house as well. If you have any questions about this product by MAZ-TEK, contact us by completing and submitting the form below. If you are looking for a specif part number, please include it with your message.